For the second period in a row Lidl has posted the strongest sales growth compared to other retailers, increasing sales by 8.1% in the 12 weeks ending July 19, Kantar Worldpanel says. 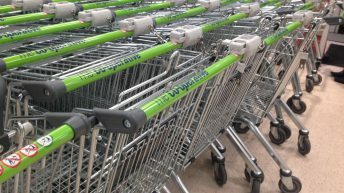 The latest supermarket share figures from Kantar show a growth in year-on-year sales of 1.1% across the grocery market. Lidl was closely followed by Dunnes Stores, who grew sales by 6.7% for the same period. 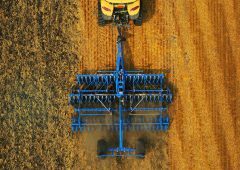 David Berry, Director at Kantar Worldpanel, said that competition is increasingly intense within the grocery market with price reductions and money-off vouchers becoming the norm. “The strongest performer has been Lidl, with impressive sales growth lifting its share of the market to an all-time high of 9%. “The discounter has recruited a record number of customers this quarter, with 66% of all Irish householders visiting Lidl at least once during this time,” he said. Kantar says that sales for Dunnes are continually being boosted by their ‘shop and save’ campaign, with shoppers buying and spending more per shop. Larger shopping trips, it says, during which shoppers are spending in excess of €100, have contributed to a sales growth of 6.7%, the highest level achieved by Dunnes in over five years. 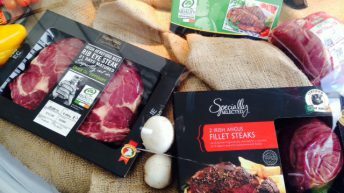 In turn this has helped to boost the retailer’s share of the market by more than one percentage point to 22.3%. 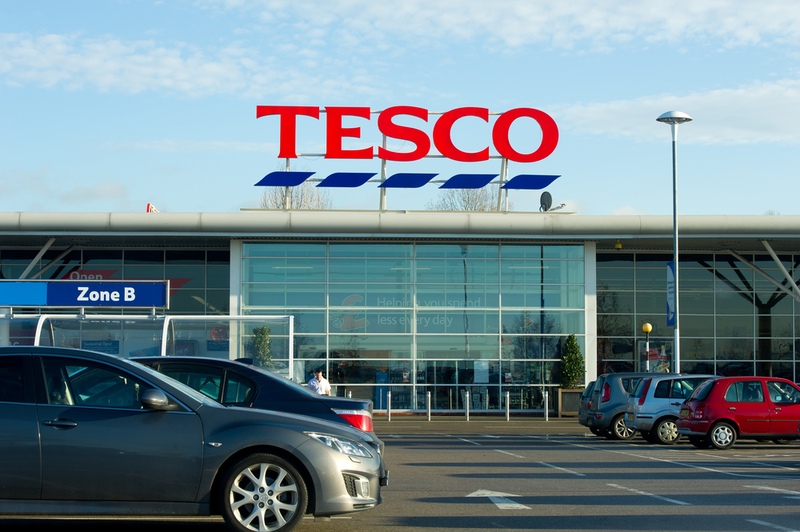 “Tesco continues to hold onto the top spot, although its market share has dipped below 25% as shoppers spend slightly less in store. 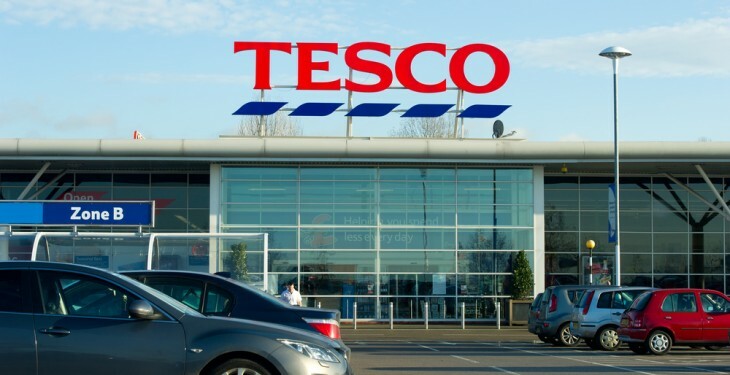 “However, there are signs that Tesco’s decline in sales are levelling off following a difficult two years, and the fall of 1.5% this quarter is the most positive performance the retailer has seen since April 2013. “The retailer is starting to successfully bring in more shoppers, with an additional 10,000 households visiting the retailer in the past quarter compared with last year,” Berry said. 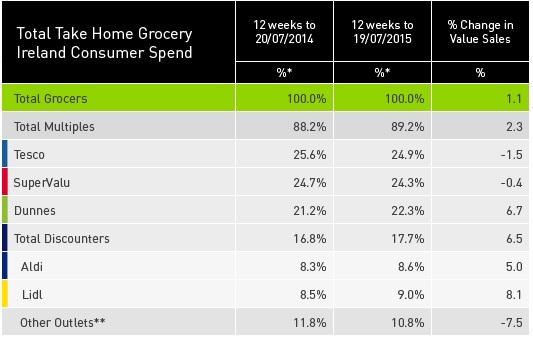 Following fierce competition with Tesco for the top spot earlier this year, Kantar says that Supervalu remains the second biggest retailer, performing in line with last year and capturing 24.3% of grocery sales. Aldi continues to grow sales, with a 5% increase lifting market share to 8.6%. However, fierce competition between the retailers has meant its rate of growth has dropped back in recent months, Kantar says.